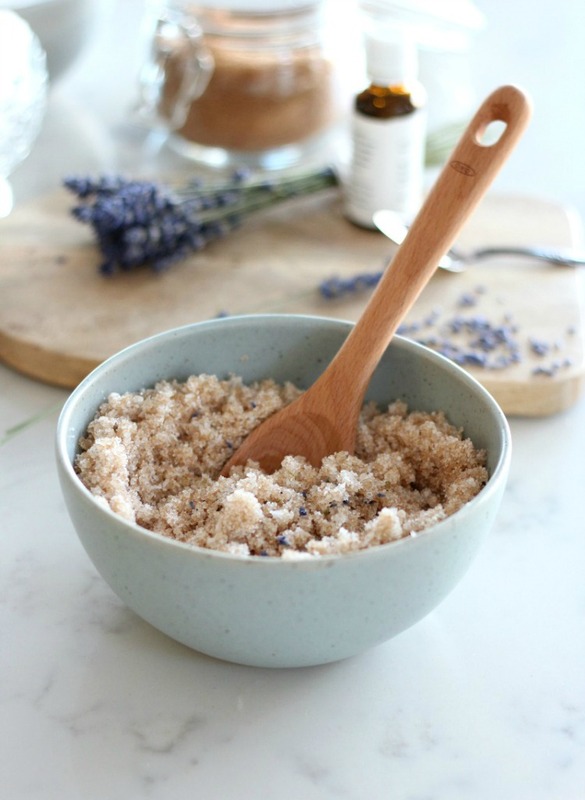 Lavender sugar scrub smells heavenly and will leave your skin feeling soft and silky. An easy handmade gift idea for the holidays or other special occasions. If you follow along on Instagram, then you probably already know I had the best lavender garden ever this past summer. Chalk it up to a very hot and dry season, I guess. I decided to take some of those dried flowers and tuck them into drawers and closets and storage bins. Perfect for keeping those pesky bugs away too! Do you love the scent of lavender as much as I do? It’s so pretty to look at, isn’t it? Of course, it can be used in countless other ways. In the past, I’ve made lavender sugar to sweeten tea and I even baked lavender shortbread cookies. So delicious! With the upcoming holiday season, I thought it was the perfect time to make some jars of lavender sugar scrub to hand out as gifts to some of my friends and family members. They’re easy to whip together once you have some simple ingredients on hand. They’re natural, too, which means you don’t have to worry about what’s being absorbed into your body. And since it tends to be cold and dry this time of year, everyone needs a little hand remedy, right? 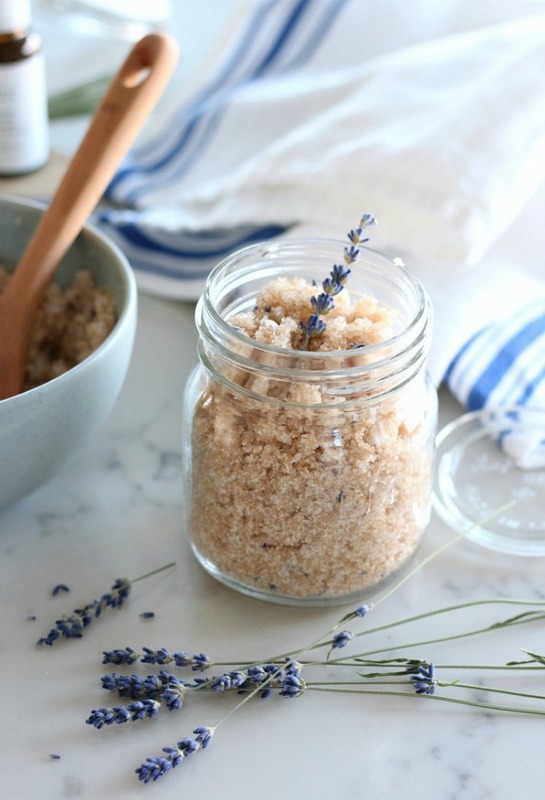 This sugar scrub recipe will leave your hands feeling silky and smooth. The sugars gently exfoliate, while the coconut oil moisturizes. Lavender is also known for its calming and relaxing qualities, which makes it perfect for the busy holiday season. I don’t know about you, but after putting up the Christmas tree, baking cookies and wrapping gifts, my hands always need a little pampering. Okay, a LOT! 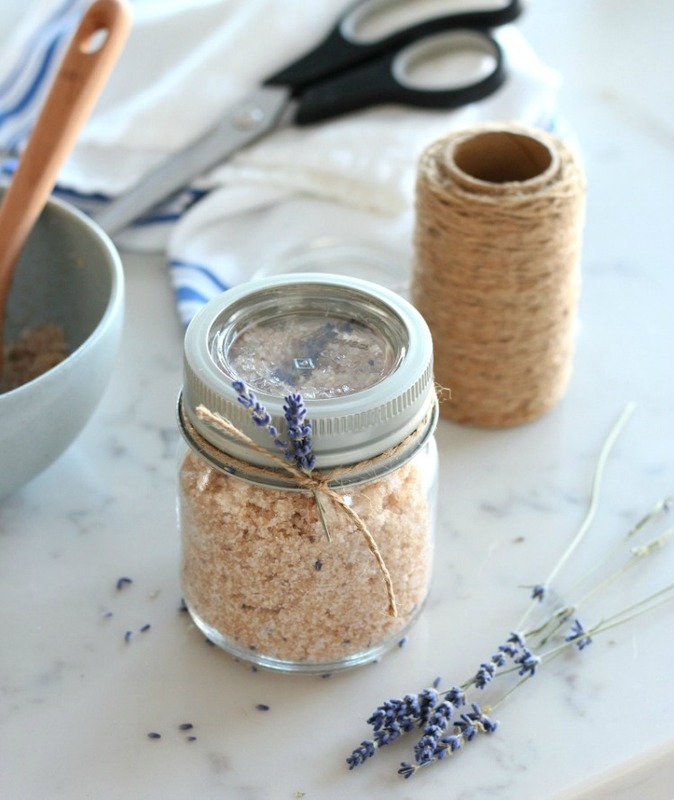 Don’t forget to take a jar of this DIY lavender sugar scrub to each of your holiday parties. Hostesses will love and appreciate this gift so much. We all know how hectic entertaining can be! Of course, you’ll want to use it year-round. 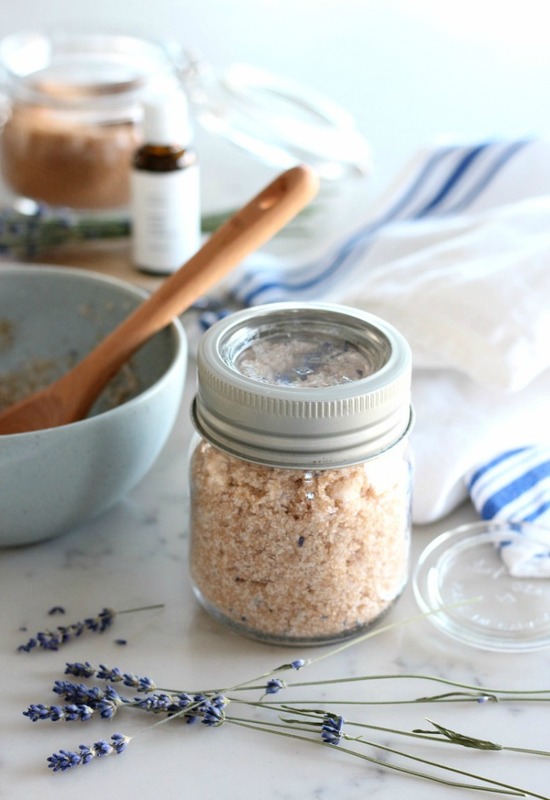 This lavender sugar scrub is a great gift for gardeners! Note- Ensure your hands and tools are clean prior to preparing the scrub to keep it free from bacteria. As well, make sure your lavender buds are fully dried before using. Combine both sugars in a medium bowl. Add coconut oil. Stir to combine thoroughly (soften in microwave for about 10 seconds if the oil doesn’t begin to soften). Add lavender essential oil, followed by the lavender buds. Mix well. Transfer to sterilized, airtight jars. Note- test a small amount on skin first and discontinue use if irritation occurs. 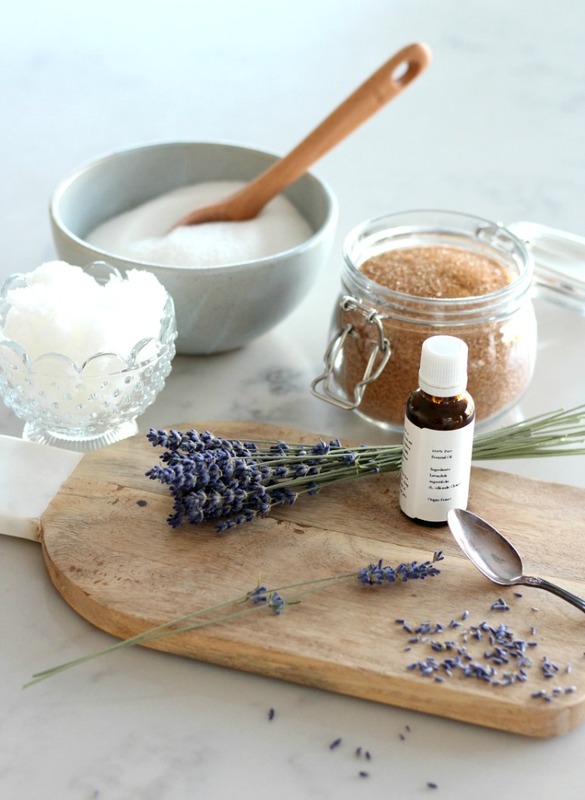 Stir the lavender sugar scrub with a clean spoon before using if mixture has separated. Add a scoop to moistened hands and gently rub over entire surface (mixture will loosen as it warms). Rinse hands thoroughly under warm water and pat dry. So, what else can it be used on? This scrub works well on elbows and feet too. Use it regularly for smooth, glowing skin! How long will this sugar scrub last? Best if used up within one 4-6 weeks, but will last even longer if you store it in the refrigerator. I like to keep a tiny jar by the sink for easy access. 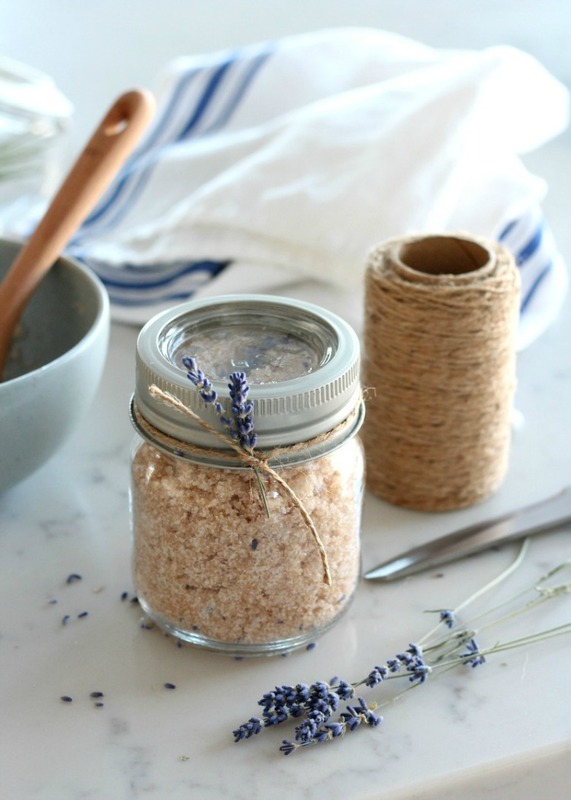 To finish off the jar, tie some jute twine or ribbon around the lid followed by a couple sprigs of lavender. So simple and pretty! Give on its own or along with a beautiful hand or kitchen towel. 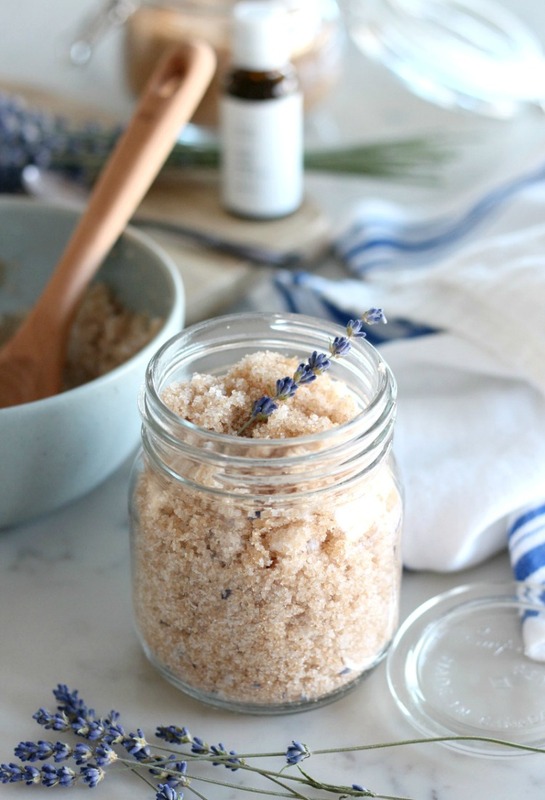 This lavender sugar scrub smells heavenly and will leave your skin feeling soft and silky. Combine raw sugar and granulated sugar in a medium bowl. Add coconut oil. Stir to combine thoroughly (soften in microwave for about 10 seconds if the oil doesn't begin to soften). Best if used up within one month. Can also be stored in the refrigerator to extend best before date. I love the smell of lavender too! It’s so soothing. I’ve never made anything like this before, but I think you’ve just inspired me. The way you bottled it is so adorable. Thanks, Nicole. So easy to put together and works like a charm (especially during our cold, dry winters)! I love making my own beauty products, and this is such a simple recipe with beautiful results, I’m sure! 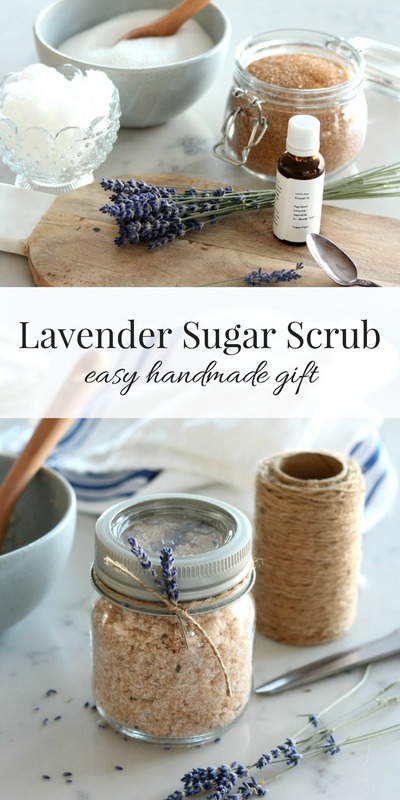 Lavender and coconut is lovely, and you’re right, it makes a lovely hostess gift!